Peapod is Giant Food store’s grocery delivery service. This project made me hungry. I designed a sister website to Giant Food's Peapod delivery page that makes it easier for people to cook more. The website allows people to integrate ingredients from recipes with their shopping cart as well as save, print, and share recipes. I researched users, scoped out the competition, conducted card sorting, designed the information architecture, sketched, created storyboards, wireframed, and finally came to the prototype and tested it. The brief listed lots of features that Peapod was looking for in their new site, and included three user personas, sample products, and brand collateral (Peapod.com). I began with extensive analysis of Peapod's competitors, including Blue Apron, Plated, Allrecipes, and Instacart. Peapod is appealing to people who want to save money. Delivering ingredients that are not pre-portioned could be an advantage. Peapod’s competitors have an advantage in the area of photos & videos. 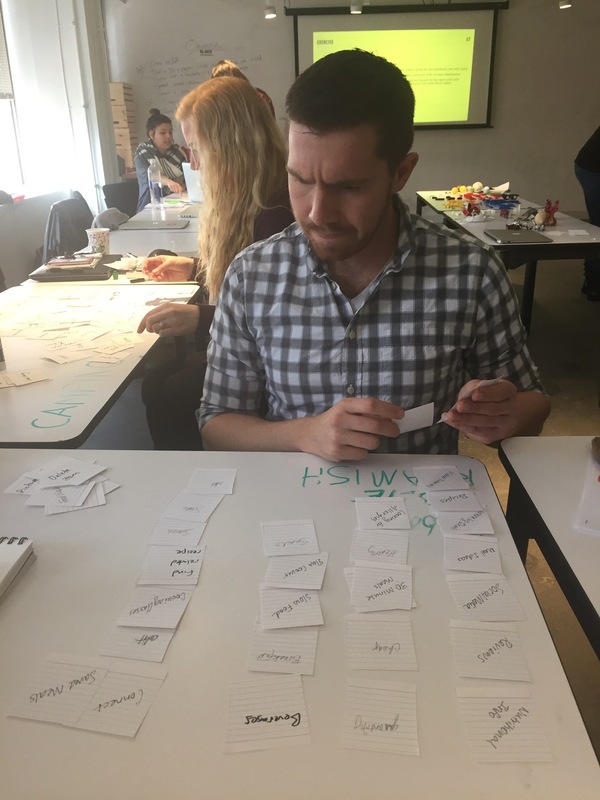 Card Sorting with users helped me see how they would organize my ideas, and helped me move on to a concrete site map and structure. There were so many categories and pieces to organize. This was the first iteration of the site map. I settled on the concept of browsing by different categories on the homepage. This was my first introduction to Axure. I realized that my browse feature was too cluttered. It needed to be in only one place on the front page, simplified, and attached to images. I tried out a My Saved Meals feature for the site. Users could browse by featured meals rather than by recipe, such as Breakfast 1, Breakfast 2, etc. Through user research, I discovered that people don't look for their recipes that way. They prefer to find them individually. I also created a Calendar feature that just seemed to confuse my users. They didn't know whether to like, favorite, heart, or save recipes and where to save them. These two features were axed. I got a bit stuck after creating all these features, wondering how to narrow it down to one user flow. I went back to storyboarding, and successfully created a flow true to Jackie, one of our personas, along with the many users I had talked to. I used Axure to create many versions of the wireframes. I narrowed it down to one user flow that made sense. Finally, I had a working prototype that I tested with users and made some last tweaks. Use your personas! They tell the story and help you create something that works. Everyone loves shrimp, and no one wants it to go to waste. Your solutions can solve real-world problems. Adding too many or too few features is a delicate balance. Navigate carefully, and listen to your gut!